Major investments into energy efficient equipment or systems are not always necessary to reduce significant amounts of energy usage. BarFly Ventures is a prime example of that. The Grand Rapids-based restaurant/bar company manages 4 locations, including HopCat, Grand Rapids Brewing Company, Stella’s and Waldron. Additionally, BarFly has opened eleven HopCat restaurants outside of the West Michigan area, with plans to open four more within the next year. 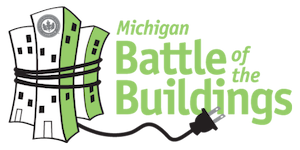 This is BarFly’s second year competing in the Michigan Battle of the Buildings, and this year Grand Rapids Brewing Company rose to the top in savings. Engaging the management team at each location to be cognizant of their restaurant’s energy and water usage, and find simple ways to reduce was key. Pictured from left to right: Cheri Holman-USGBC West Michigan, Carrie Veldman-Barfly Ventures. BarFly took a unique approach to reducing its energy usage by starting a conversation with its employees about being aware of the energy they use. Staff and management took actions to adjust temperature settings more efficiently, and to establish procedures for opening and closing the restaurants in order to ensure that lights and equipment were not used unnecessarily. These initiatives reduced Grand Rapids Brewing Company’s energy usage by 8.5 percent in the 2016 calendar year, with very little investment in energy-efficient equipment and systems. The process, however, was not a cake walk. Restaurant lighting must be on most of the day, even for the cleaners at night. Furthermore, trying to efficiently monitor and adjust temperatures can be difficult, especially when considering the steady flow of restaurant guests in and out of each location. Finding a system that works for Grand Rapids Brewing Company, its staff and its valued customers was a challenge, admits BarFly Sustainability Manager Autumn Sands. “Sustainability initiatives, as a whole, are rare in the restaurant industry,” she says. BarFly is up for the challenge of breaking new ground when it comes to being green. Reducing energy waste is as important as investing in more energy-efficient equipment, and much less costly.